The California High-Speed Rail Authority (CHSRA) is responsible for planning and constructing a high-speed system of electrically powered trains to transport commuters and help reduce traffic and air congestion. The hotly-contested plan is to build 800 miles of track between the San Francisco Bay Area and Southern California, connecting the regions by 2020 with trains capable of reaching 220 miles-per-hour. That speed means that, including stops, a passenger boarding in San Francisco could be in Los Angeles in about 2 hours and 40 minutes, according to the agency. The rail authority estimates the project will cost $42.6 billion, but critics have projected a tab as high as $100 billion. The rail authority was created in 1996, building upon feasibility studies from the Intercity High-Speed Rail Commission that operated from 1993-1996. Its first director was appointed in 1998. It has a nine-member policy board (five appointed by the governor, two appointed by the Senate Rules Committee and two by the speaker of the Assembly) and a core staff. The rail authority released its first business plan in 2000 and a draft environmental impact report in 2004 describing the proposed program’s statewide effects. The state certified the report in 2005. State voters approved the sale of $9.95 billion worth of bonds (Proposition 1A) in 2008 for high-speed rail and related construction. A year later, Congress passed the American Recovery and Reinvestment Act, which earmarked $8 billion for high-speed rail nationally, and in February 2010, the Obama Administration announced a six-year, $53 billion plan for high-speed rail. It is expected that California will be the largest recipient of these federal funds if they survive budget battles in Washington. In December 2010, the rail authority board voted to begin construction of the first 54 miles of the system between Fresno and Bakersfield. But as price estimates rose in a bad economy, and questions were raised about the decision to begin construction in the low-density Central Valley, doubt was cast on the very survival of the project. Newly-elected Governor Jerry Brown, a strong supporter of high-speed rail, bucked the political tide and became one of its most vocal supporters. In January 2012, shortly after a peer review group released a pessimistic report to the public, both Executive Officer Roelof van Ark and board Chairman Tom Umberg announced their resignations. The group found the “incomplete” business model to be simply an “illustrative” concept rather than a concrete plan, and it considered the lack of any long term funding commitments “a fundamental flaw.” It thought that estimates of usage were unsupported by facts, rising capital costs were not properly identified (much less contained), the decision to build in the Central Valley was an unnecessary risk, and the Rail Authority itself was not up to the task of managing a project of this size. Ultimately, the group found that it couldn’t make definitive judgements about the project for the lamentable reason that it was in such disarray. Construction is expected to begin in September 2012. The CHSRA is responsible for planning and constructing the proposed rail corridor. The rail authority is studying prospective routes, soliciting public input, directing funding and selecting up to 24 passenger stations along the line. It is the clearinghouse for expressions of interest to participate in the design, construction, funding, operations and maintenance for the fledgling system. It is also the project’s lead cheerleader. According to CHSRA, without the high-speed rail project, California would have to build about 3,000 lane-miles of freeways, five airport runways and 90 departure gates by 2020. It also estimates the state could reduce its dependence on foreign oil by about 12.7 million barrels yearly and cut greenhouse gas emissions by about 12 billion pounds each year. Defenders of the program point out that recent changes in the economy, sudden availability of major federal funding, recently passed state bond issues and pressing environmental concerns have accelerated the timetable for developing high-speed rail and introduced not unforeseeable issues. They argue that a project of this magnitude can’t anticipate every funding source, develop every procedure and map out a precise timetable in a combustible political climate. Some of the work will have to be done on the fly. However, the auditor was at least equally harsh about failures in fundamental business practices. In response to the auditor’s report, rail authority board Chairman Curt Pringle acknowledged that many of the criticisms were valid and that they echoed an earlier report from the Office of the Legislative Analyst which the agency had used to correct many of the flaws. But he took umbrage at the report’s cover page: “We do believe, however, that the report’s inflammatory title is overly aggressive considering that the contents of the audit’s findings are not equally scathing,” Pringle wrote. The first leg of the proposed 800-mile route, which is scheduled to begin construction in 2012, is to be built in the central valley, the state’s breadbasket. Farmers are complaining that the project will destroy farmland and hurt property values. Some almond growers worry that the trains could generate high winds that might disrupt bees from pollinating their crop. Rail authority Chief Executive Officer Roelof van Ark dismissed that fear, but acknowledged that the agency needs “to do a better job of communicating” with potentially affected residents. Corcoran, a small farming community, is smack in the middle of the first leg. NPR interviewed one farmer who has been in Corcoran for 50 years. Barrie Boyett said he doesn't know exactly where the train will go, but he's pretty sure it's going to run right through his ranch land. "It'll ruin our ranch, I mean absolutely ruin it. And I know how the government works: They'll buy the land at the cheapest price they can get it for." The rail authority, with encouragement from Congress and looking to get maximum bang for its buck, decided to begin construction in the hinterlands 150 miles southeast of San Francisco. Land is cheaper and resistance more easily overcome there than along a route involving a major metropolitan area such as Los Angeles or San Diego. But despite a legislative directive that the first leg connect to some moderately populated area, the rail authority designated that the first 65-mile leg run from Borden south to Corcoran. The New York Times describes the area, south of Madera, as “miles of farmland, a collection of dingy fast food outlets and a gold rush ghost called Borden, where all that remains is a tiny cemetery devoted to long dead Chinese workers.” Meanwhile, Corcoran’s claim to fame is its state prison, which numbers 12,000 “guests of the state” among its 26,000 residents. Corcoran City Manager Ron Hoggard defended his town. “We heard things like it’s the ‘train to nowhere’ and we tell people we’re not nowhere, we’re Mayberry.” About the time a roar went up about the “train to nowhere,” additional federal funding became available and the route was extended south to Bakersfield. While the current business plan calls for initial construction of the rail project in the Central Valley, the “initial operating segment” would actually be the stretch of track that connects it to a major metropolitan area in Southern California or the Bay Area. And no decision has been made on which direction the state would go. Recent ridership predictions by the rail authority estimate that the system will have between 88 million and 117 million passengers a year by 2030. However, under various scenarios offered by the agency, the number of passengers could be as low as 40 million passengers a year. A report from the Institute of Transportation at the University of California, Berkeley, questioned the fundamental assumptions used by the rail authority’s primary ridership study contractor, Cambridge Systematics (CS). While making no ridership projections of its own, the study listed seven crucial technical errors, deemed the rail authority’s projections unrealistic and warned of possible “significant revenue shortfalls.” It called for a new ridership study. “The forecast of ridership is unlikely to be very close to the ridership that would actually materialize if the system were built,” said Samer Madanat, a civil engineering professor and the institute’s director. “As such it is not possible to predict whether the proposed high-speed rail system in California will experience healthy profits or severe revenue shortfalls.” In response to the institute’s study, prepared at the request of the state Senate Transportation and Housing Committee, the rail authority’s chief executive officer, Roelof van Ark, said predictions of a revenue shortfall were “extraordinary” and without foundation. Democratic state Sen. Alan Lowenthal, a supporter of high-speed rail, introduced legislation in February 2011 to overhaul the agency. The bill would replace the entire board of directors by January 2012 with appointees possessing “specific expertise.” It also would establish an ethical code and more accountability for the board. Lowenthal would like to see the board include experts in finance, the environment, construction law, business and large-project engineering as well as representatives of local governments and labor. Although the rail authority is listed on the government’s budget website as being within the Business, Housing and Transportation Agency, it is actually an independent entity. Lowenthal’s bill would have it report directly to the larger agency, whose governor-appointed secretary would sit on the rail authority’s board. Its executive director and the five board members appointed by the governor would be confirmed by the state Senate. Under the new ethics rules, prospective board members could not have worked for companies doing business with the board for two previous years and would be barred from the same for two years after leaving the board. Board member Lynn Schenk, who was state Business, Transportation and Housing director the first time Jerry Brown was governor, said that the department wouldn't be able to give rail the attention it needs. To put it under that department now, she said, "would lower the focus (on high-speed rail) rather than heighten it." She said she didn't oppose the other provisions of the bill. One measure proposed by Democratic Sen. Lou Correa would require all board members to file state conflict of interest disclosure forms and excuse themselves from discussions when items that could be a conflict are discussed. And another bill by Republican Assemblywoman Diane Harkey would abolish the high-speed rail project completely. A peer review group convened by the legislature suggested that state government does not provide an appropriate framework for managing a project of this magnitude. The group found the rail authority understaffed, lacking a business model, using unrealistic financial assumptions and showing a lack of appreciation for risk management. Supporters of high-speed rail (HSR) often cite overseas success when touting plans for California. Japan began operating an HSR system in 1964 at speeds of about 130 mph. By the 1990s, speeds in excess of 180 mph were common. In 2007, Taiwan inaugurated a 214-mile HSR system. It uses Japanese technology and the trains run at a top speed of 186 mph. Spain opened an HSR line in 1992. France operates 1,160 miles of HSR lines with average speeds of 180 mph. China has 1,365 miles of rail lines with a top speed of 217 mph. As of December 2010, the Spanish system is the longest HSR network in Europe and the second in the world, after China. The conservative Heritage Foundation argues that all these systems have been financial failures and that the 267-mile French service between Lyon and Paris is only one of two financially solvent lines in the world. Who is Behing the Anti Movement? The Reason Foundation and the Heritage Foundation cited above are leading voices opposing high-speed rail. Both are heavily financed by Koch Industries, an oil, gas, ranching and financial services conglomerate controlled by billionaire brothers David and Charles Koch. David Koch is director of the Reason Foundation. Morshed and four members of the board (Curt Pringle, Lynn Schenk, Quentin Kopp and Tom Umberg) were the subject of a Fair Political Practices Commission investigation in 2010 over trips they took to Europe. The trips, which included visits with manufacturers, government officials and rail operators, were paid for by foreign governments trying to help their homeland firms win large contracts. Allegations of undue influence by contractors has dogged the rail authority for years. All five were cleared by the commission. Facing federal deadlines and a skeptical public, the High-Speed Rail Authority reached out in May 2012 to former Caltrans Director Jeff Morales to be its chief executive officer. Morales grew in the Washington, D.C., area after his father, George Morales, an anesthesiologist and native of Mexico, settled there in 1951. The elder Morales was part of the trauma team that attended to President Ronald Reagan after the 1981 attempt on his life. 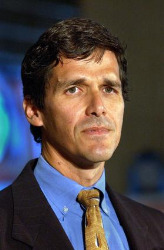 The younger Morales received a bachelor of science degree in biology at George Washington University in D.C. After graduation in 1983, he went to work for Democratic U.S. Senator Frank Lautenberg, specializing in environmental issues before shifting to transportation when the senator became chairman of the Senate transit appropriations subcommittee. Morales moved to the executive branch of government in 1993 as special assistant to Secretary of Transportation Federico Pena. Two years later, he joined Vice President Al Gore’s National Performance Review task force aimed at streamlining government before a stint as issues director for the White House Commission on Aviation Safety and Security. Morales left Washington for the Midwest in 1998, taking a job as executive vice president of management and performance for the Chicago Transit Authority. He stayed two years. Morales took over the top job at Caltrans in June 2000 and was widely credited with turning around that troubled behemoth. He oversaw $10 billion in construction projects and introduced the innovative FasTrak electronic toll collection system to Bay Area bridges after long delays that preceded him. He had been appointed by Democratic Governor Gray Davis and resigned in 2004 after Republican Arnold Schwarzenegger was elected governor. Morales immediately signed on as a senior vice president with Parsons Brinckerhoff, an international consulting, engineering and program management organization. He has been working as the director of markets for the company’s Americas Operations and serves as their director of strategic initiatives and government relations. Parsons Brinckerhoff is project manager for the rail authority and has several hundred employees already working on it. After a year of setbacks and controversy, Roelof Van Ark announced in January 2012 that he was going to step down as chief executive officer of the California High-Speed Rail Authority. Minutes after he announced his decision, board chairman Tom Umberg tendered his resignation, although he said he would remain on the board. Van Ark earned a bachelor's degree in electrical engineering and an MBA from the University of the Witwatersrand in Johannesburg, South Africa. Upon graduation in 1976, he joined Siemens LTD, South Africa, becoming joint managing director by 1993. Van Ark transferred to Berlin, Germany, in 1995, where he was president of Turnkey Transportation Systems for Siemens AG Transportation Systems. Four years later he became president & CEO of Siemens Transportation Inc.
Van Ark left Siemens in 2002 for Invision Technologies, where he held the post of president of Aviation Security. A couple years later he moved to GE Homeland Protection Inc, but stayed there less than a year before becoming president at Alstom Transportation Inc. Alstom is the company that builds France’s bullet trains. Five years later, in June 2010, he was selected as the California High-Speed Rail Authority’s chief executive officer. Van Ark oversaw the drafting of an updated business plan that doubled the estimated cost of the project. As the price rose in bad economic times and questions were raised about the project’s plan to start construction in the Central Valley, far from major urban areas, its popularity plummeted.